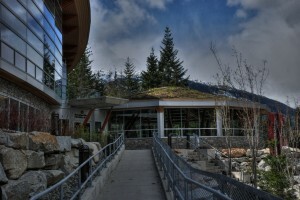 The Skwxwū7mesh Liĺwat7ul Cultural Centre (Squamish Lilwat Cultural Centre) in Whistler is a fantastic culmination to the Sea-to-sky Cultural Journey (related post). I arrived at the Centre early on a Wednesday afternoon and was struck immediately by the stunning approaches to the building (Figures 1 & 2). Inside, the beauty of the Great Hall (Figure 3) was almost overwhelming. The very friendly staff helped me register as a local visitor which, for the price of a one day admission, gives access to the Centre for a year. They also set me up with an iPod-like device so that I could tour the centre with audio accompaniment. The audio tour directed me through a series of exhibits. It is well-paced, not rushed but not plodding either. The exhibits are small cases, larger items, and video screens. They cover topics like stone tools, the use of trees and the technology of harvesting bark and other tree products, the seasonal round, and fishing. The weavings are spectacular. 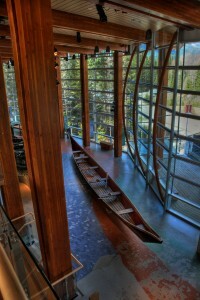 There are several carved canoes on display in the Great Hall too (Figure 3). The entire centre is illustrated with archival and contemporary photography and short videos. The Squamish and Lilwat territorial maps are detailed and present a convincing picture of the extent of the use of the territory (if one is still needed by this point). There are four small galleries beyond the Great Hall. There, cedar and wool regalia are shown. The mythology of the Wild Woman is presented along with a giant basket. A video and interactive touch screens allow visitors to explore traditional and contemporary culture. The tour concludes in a gallery of weaving. I was steered from there outside to pithouse and longhouse replicas. But, for me, the highlights of the SLCC are the people and a film presentation called Where Rivers, Mountains and People Meet. 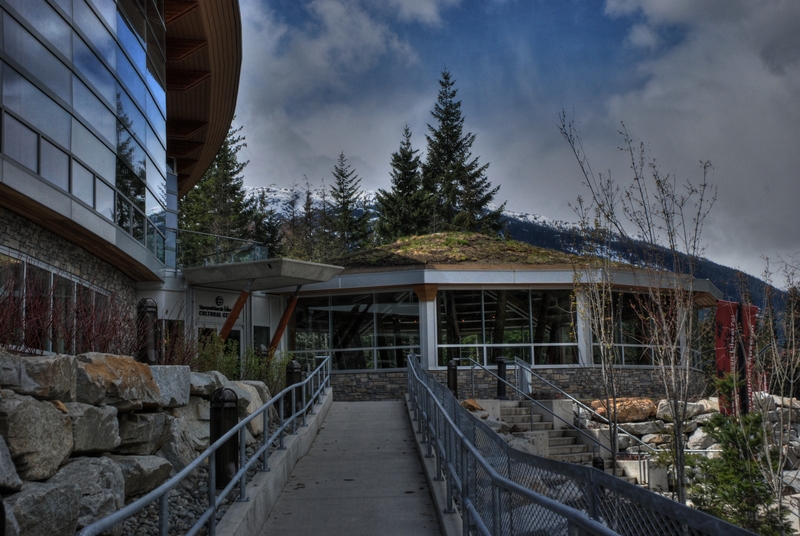 The Centre is staffed by friendly and helpful young people from the Squamish and Lilwat Nations. Two women sang in Skwxwū7mesh for a small group of us. The film was introduced by a woman who made an extended presentation in Skwxwū7mesh, too. It was remarkable hearing the Skwxwū7mesh language used regularly throughout the Centre. David Baker gave a short workshop on cedar during which we were allowed to hold, feel, experience different types of cedar weaving. For each of the song, film, and workshop, I was approached by centre staff and politely invited to participate in the next event. 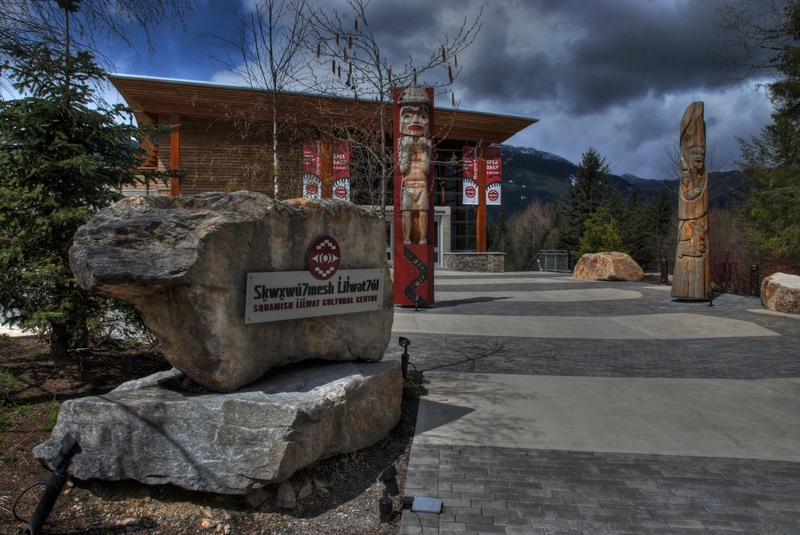 Through the tour, workshops, and film I was left with the sense that the Squamish and Lilwat peoples and their cultures are vibrant and thriving. Thanks again to Drew Leathem, general manager, for sharing a piece of bannock from the Centre’s Cafe with me. It was a treat hearing about the process of developing the Centre. I congratulate him and the staff for making such an informative and welcoming place. Please visit the Squamish Lilwat Cultural Centre’s website and the website of the Cultural Journey along the highway. Also, check out my set of photographs from the SLCC and from my entire trip along the Sea-to-sky Highway. This was written by Tad McIlwraith. Posted on Sunday, May 2, 2010, at 9:38 am. Filed under First Nations, History, Resource Use, Teaching, Vancouver, Websites. Bookmark the permalink. Follow comments here with the RSS feed. Both comments and trackbacks are currently closed.